When you travel to Old San Juan, Puerto Rico, you are going to paradise. It has historic architecture and landmarks. Its streets are cobblestone and houses are colorful. No wonder many people choose to go to this Caribbean island for a vacation as it is a beautiful place to retreat. Although there are plenty of first-time visitors, there are also a lot of returning visitors, too. With it being a delightful sanctuary, people always want to come back for more. Its hot tropical climate is made up of a wet and dry season. People often choose to come during the dry season as it provides preferred vacation type weather. Others do come during the wet season, too, as it is not as hot during this time of year. With the coldest month being January and wettest in February. It is essential to check the weather when planning your trip to ensure you arrive in San Juan to desired weather. If you do choose to come annually with family or have made it a tradition with friends, it is essential to know where to stay. Whether you are vacationing in San Juan, Puerto Rico for personal or work-related reasons, you will need a rental apartment or home with appropriate accommodations. If you are a returning visitor, you may opt into possessing a seasonal home, instead. Either way, it is best to know your options for vacation rentals in Old San Juan. If you are a first time visitor, you most likely have a lot of questions about vacationing on this Caribbean island. Here are ten frequently asked questions about traveling to Old San Juan. 1. Is it a long flight from the United States to Old San Juan? The flight to Old San Juan is not a long one. When traveling by airplane to Puerto Rico from the United States, it takes approximately 3.92 hours to arrive. If you watch a movie and take a nap during your flight, you will land on this tropical island in no time at all. 2. What is Puerto Rico’s First Language? The locals in Puerto Rico speak both Spanish and English, but Spanish is hands down the dominant language, as the majority of the people in Puerto Rico are not proficient in English. It is ideal to be fluent in both languages, but if you are not, it is a good idea to bring a Spanish translation book or to use an app. 3. Is Old San Juan a Part of the United States? This question is asked a lot for many people are unsure if Puerto Rico is a part of the United States or not. Some think it is the 51st state, while others believe it to be its own country. It might be surprising for some, but neither is true. Puerto Rico is an unincorporated territory of the United States located in the northeast Caribbean Sea. Its official name is the Commonwealth of Puerto Rico, but most people know it and call it, Puerto Rico, for short. 4. Is a Person Born in Puerto Rico an American Citizen? Although Puerto Rico is not a state, Puerto Ricans are indeed United State Citizens. Many do not know that on March 2, 1917, the Jones–Shafroth Act was signed, making Puerto Ricans United States citizens without rescinding their Puerto Rican citizenship. So the simple answer to this question is, yes! 4. Do I Need a US Passport Necessary to Travel to Old San Juan? As an American citizen, you do not need a passport. With that said, you will need some government identifying documents, like a driver’s license or another valid form of photo ID. Interestingly, Puerto Rico and the U.S. Virgin Islands are the only two destinations in the Caribbean) that do not require U.S. citizens to carry a passport. However, if you are not from the US, you will need to have a passport to travel to Old San Juan. 5. What is the Local Currency in Old San Juan, Puerto Rico? The U.S. dollar is the official currency of Puerto Rico. If you are not an American, it would be wise of you to convert your cash before vacationing in Old San Juan, Puerto Rico, to avoid any issues. 6. What Should I Pack When Going to Old San Juan? 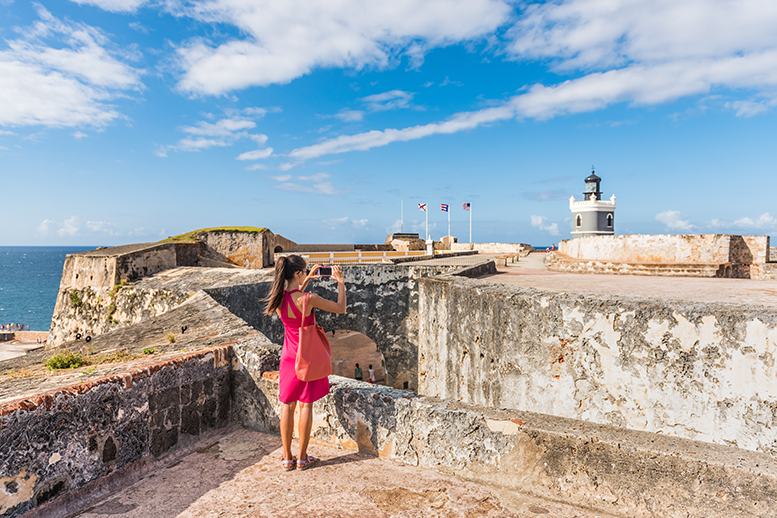 Besides U.S. money, you should bring several specific items with you when you travel to Old San Juan. The weather in Puerto Rico is sweltering and humid; therefore, it would be a good idea to bring lightweight clothes with you to be as comfortable as possible. It is also best to avoid pants, and closed toe shoes as wearing shorts and sandals or flip flops allow for you to remain cooler. Be sure to pack sunscreens and a hat. If you plan to spend any time outside (which you will) in Old San Juan, then you will want protection from the hot sun. 7. What are the Best Ways to Travel In and Around Old San Juan? There are several different methods of transportation to travel in and around Old San Juan. Depending on preference, distance, and your destination, you can choose to walk, ride a free trolley, rent a car, take a taxi, ride the bus, ride the ferry, ride a bike, take a guided tour, or use chauffeured transportation. 8. How Do I Find the Best Vacation Rentals in Old San Juan? Before your stay, you will want to pick a great place to stay while in Old San Juan. There are a variety of vacation rentals for long or short-term vacations. You can choose to rent an apartment or house; it depends on your preference. You can decide on the size, location, and the number of rooms. Be sure to make an Old San Juan vacation rental reservation ahead of time to ensure you get to stay in a place that you will enjoy. 9. What is the Food Like in Old San Juan? To get an idea of Puerto Rican cuisine, here are a few dishes. Arroz con dulce: Sweet sticky rice cooked in spices, ginger, milk, coconut milk, raisins, and rum. Arroz con gandules y lechón: Yellow rice and pigeon peas with roasted pork. This is considered the island’s national dish. Asopao: This is a soup, similar to gumbo. It is made with rice, shellfish, chicken, chorizo and other ingredients. You will want to try them all! 10. What are Some of the Best Restaurants in Old San Juan? Viejo, otherwise known as Old San Juan is known for its history, culture, and exceptional dining. When on vacation, you will want to dine at the best restaurants and taste all the delicious dishes, Old San Juan has to offer. After all, you will be exploring some of the best food the Caribbean has to offer, why not ensure you eat it at the best restaurants. Here are just a few to get you started. This restaurant and bar combo is near the entrance of Old San Juan. El Asador is known to have the loveliest indoor patios in town and is a big part of Old San Juan nightlife. If you are looking to drink and dine in style, then El Asador the place for you. With the best mojitos in town, you do not want to miss out on choosing to eat at El Asador. It is here where you will find authentic Puerto Rican cuisine with a modern twist that adds appealing new flavors to each dish. The restaurant has high archways and tall ceilings; it is a beautiful spot to dine. It will give you a real Caribbean feel. An affordable and traditional style restaurant, El Jibarito serves delicious classics every night. It is an easy restaurant to recognize with its beautiful turquoise exterior and luxurious decor. Inside, the atmosphere is a mixture of relaxed and fun. El Jibarito celebrates the traditions of Puerto Rico in everything they do; it is the perfect place for a casual night out with family and friends. Historical and tropical Old San Juan is a slice of paradise and a beautiful place to spend your vacation. Some choose for it to be a seasonal or annual vacation, while others prefer to make Puerto Rico their first or second home. So do not be surprised if these thoughts run through your mind, too. It is hard not to want to live on this stunning Caribbean island. And now that you have answers to your questions, all there is left for you to do is pack a bag and decide on the date of your arrival in Old San Juan.